The beach in Playa del Seville. The Los Santos Freeway in Playa del Seville. 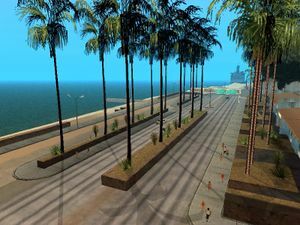 Playa del Seville is a district in southeastern Los Santos, San Andreas, and is a strong hold of the Grove Street Families, in particular the Seville Boulevard Families. There are no specific residents of the area, although LB, Ryder's friend, owns a garage in the area. North of the area is the Los Santos Forum and East Beach. To the west, meanwhile, are the districts of Ocean Docks and Willowfield. Playa del Seville does not feature much in GTA San Andreas. 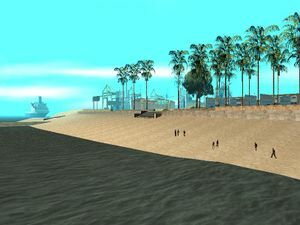 During one mission, Carl Johnson rescues his brother Sweet and his girlfriend, from Playa del Seville (after Seville Boulevard Family members start attacking them). Other than this, Playa del Seville appears as the location of LB's garage, where stolen items are kept. These include from Colonel Fuhrberger (during the mission Home Invasion) and when doing the burglary side mission. This page was last modified on 27 July 2012, at 00:48.